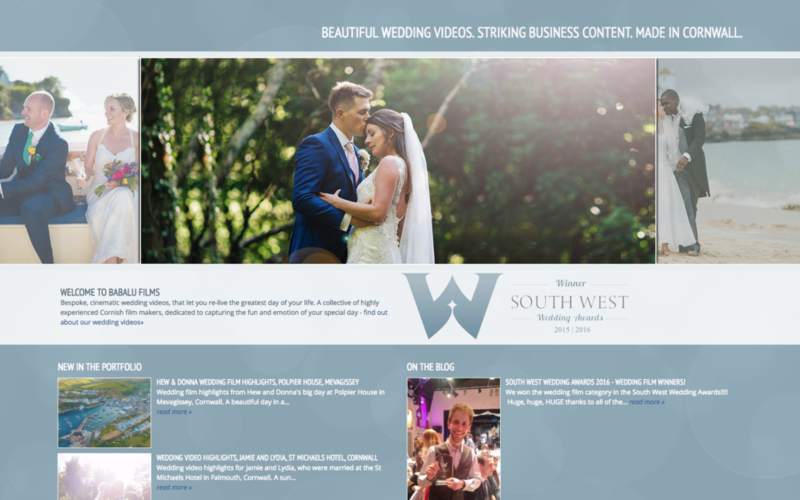 We’ve been producing wedding videos in Cornwall and Devon since late 2012 – and we’ve had the same website since day 1 (see picture!). Now, we’re pleased to unveil a spangly new website to show off all our latest wedding film edits! We love old Babalu, it has served as brilliantly for 4 years. It’s easy to navigate, and we still like the think it looks pretty good! But unfortunately, it’ starting to show it’s age – there’s no mobile optimisation (remember, in 2012, in the time of a barely manufactured iPhone 4, that wasn’t important!) and it doesn’t have any of our new branding. Because we still love Old Babalu, it’s going to continue to live on for a couple more years. It will still keep it’s (rightful) spot at the top of Google (it took years to get there! ), but will just point to this new site. New Babalu looks lovely! We’re so happy with the video that appears at the top when you first land, and the long scrolling design is a bit more contemporary. It’s actually all been designed by our 2nd camera operator, Luke (who also runs Pear Wood Photography) – he’s a very versatile man! We’d love to hear what you think! We spend so much of our time editing wedding videos (each edit is 45+ hours) that it’s hard sometimes to take some proper time to stand back and look at the business as a whole. Please feel free to drop us a line and let us know what you like or think we should improve!